Welcome to District Of CBD! Washington DC’s only full Art gallery catered to those seeking an alternative naturopathic life style providing an artistic gallery of local DMV artist encompassing creativity & healing. 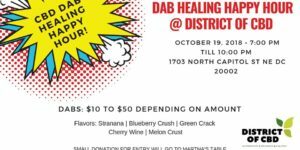 Come join the team at District of CBD with its first CBD dab healing happy hour!! Dabs will be charged based on amount your requested starting at $10. Definition of Dabbing: Dabbing (1) – Vaporizing concentrated CBD, in the form of wax or hash, by placing it on an extremely hot metal object called a nail and inhaling the vapors produced. The nail is usually heated via blowtorch. Inhaling the highly concentrated pressed hemp will leave you feeling relaxed in a euphoric state. Light snacks and drinks available. Dabbing is a great way to relive stress, and feel much better after a long day at work, gym,or just a regular day being you! We have multiple flavors such as Strawana, Green Crack, Cherry Wine. Questions before you come, please email us info@districtofcbd.com.